Retro gaming today has evolved a lot in the past ten years. What is considered "retro" is highly subjective to the user's age and experience. I consider anything pre-1999 as retro, because there is a division in time for me personally, as prior to that was education and schooling, and post that was my professional career. My nostalgic memories of gaming stem from when I was a kid, and so that just happens to have that particular timeline, but everyone is different. The advent of the internet has obviously changed the world, and gaming in particular in a number of ways. Retro game accessibility is nearly unlimited via online shopping/auctions and emulators. Ebay has made it possible to acquire any game you desire, for a price. You will be paying a premium for a specific game, but consider also the time and difficulty of finding a game in "the wild". Like any commerce, there are fees for convenience. For those who may not know, emulators make it possible to experience games without having to own them. They are programs that run the software of older games, but on modern computers/devices. The digital files of the games are called roms (read-only memory) and are easily found online for free. There may be a small amount of technical know-how, but emulator programs can be as easy to install as a typical computer program. Initially, this meant you are playing older games on a computer. This may not sound appealing, as sitting at your computer playing games is not necessarily a common nostalgic experience. Recently, with products like the Retron 5, Retro Freak, NES Classic, Retropie, and others, you can now play emulated games on your TV instead of a computer, which is a breakthrough for casual players. People who have not gamed since their youth now have modern access to games, and probably have the disposable income to spend on it. There are varying opinions on what way to play retro games is best, and there are several factors. For one, these games are older and limited in supply. Not many people keep around 25+ year old equipment around, and so much of it has been lost over time to landfills. Whatever remains is now in demand, and since retro gaming is in vogue, the simple law of supply and demand sets in firmly. This is one reason why emulation is popular, the fact that it is free*. Some people don't care if the game is physical, or a rom on a computer, they just want to play it. Some people with highly attuned gaming aesthetics dislike emulation, as the programs may falter as far as sound or visual accuracy. Younger players would probably not notice, but someone who has spend hundreds of hours playing their favorite games over and over as a kid will most likely find those kind of differences noticeable. So these people may strive for original hardware and games. The problem here, is that older video standards that existed when these systems were produced are no longer observed. High-definition televisions do not play well with a) the older physical video connections, and b) the video signal configuration. I covered this topic in some detail in a prior post a while back. If your television even accepts the signal, it will most likely look like garbage. Since the signal sent by the console is one of a different era, to the television it is almost like a different language. Modern tvs will have upscaling programs to make sense of the outdated picture information, but these are not too great since television manufacturers didn't make this a priority; they don't think too many people will hook up old technology to their tvs. If you don't mind the blurry pictures, then you're all set. However, there are ways to cleanup and improve the picture quality, significantly, if you are willing to invest in some upscaling equipment. For example, the original Nintendo Entertainment System (NES) outputs a 240p signal, through RF or composite connections. This is a prime example of a system that will look terrible on a modern tv. To clean up the image, the NES can be modded to have a picture processing unit (ppu) that outputs an RGB video signal, which can be sent through a scart cable, which can be upscaled to be properly displayed on a modern tv. Or, as in my case, the signal can be converted into a YPbPr signal, which can be fed into a CRT television that has a component connection. This is more work than most will go through, as the amount of equipment necessary starts to escalate, as does the monetary investment. The controversial Retron 5 is possible middle of the road solution that balances high definition standards and cost effectiveness. Here is where emulation clone systems come in. 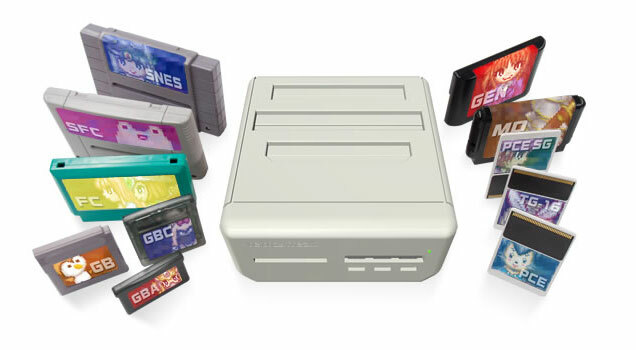 The first I'll mention is the Retron 5, made by Hyperkin. It can play NES, Famicom, Genesis/Mega Drive, SNES/Super Famicom, Game Boy, Game Boy Color, and Game Boy Advance carts (and Master System, if you have the power base converter). It is an Android based clone, that you need actual game carts to play. I give credit to the developers for this, as it does not condone piracy. Then I take that credit back when I found out that they used open-source code for their emulators when the emulators should not have been used for commercial use. They should have approached the code writers upfront, instead of apologizing after the fact, and that has spurned a hate campaign towards this device. Aside from that, the upscaling to 720p via hdmi looks great, scan lines are offered, as well as the other modern conveniences of emulators (save states, filters, blue tooth controller compatibility). It has controller ports for the original NES, SNES, and Genesis controllers, which is a huge selling point, since the included controller is horribly uncomfortable. This is an option for people who want to reduce the number of consoles hooked up to their tv, and upscale the image quality. I like it for those reasons, but also because I can now use save states, especially for hair-pulling games like Castlevania, Ninja Gaiden, and so on. One commonly cited drawback is that the console has a strong grip on the carts, referred to as the "death grip". I didn't find this to be a problem; I just pull my carts out from one side and it slides out easily, but maybe the units are different. The Retro Freak is ready for all of your carts...except for the NES. Another option is the Retro Freak, made by Cyber Gadget. I don't actually have this system, hence the stock photo. It is very similar to the Retron 5 in that it plays original carts upscaled to 720p over hdmi, emulator features are included, and original controllers are supported if you have the additional accessory. If not, you can use the stock controller or any other usb controller. Also, this controller adapter allows for one of each type of controller to be connected, not two, so player two will have to use the included controller, or some other USB controller. It differs from the Retron 5 in that the roms can be loaded from the carts, and stored on an SD card. This also means that roms can be loaded onto the SD card instead of being dumped from the cart, so....no actual cart needed. The law around copyright of roms is hazy at best, and there are people on both sides convinced their interpretation is right. So depending on your view of rom acquisition, let's just say this system gives you options. Another major difference is that the Retro Freak can play Turbo Grafx/PC-Engine and Super Grafx Hu-cards. For many, this fact trumps the Retron 5 outright, as options for Turbo Grafx/PC-Engine are limited. Since this was only released in Japan, there is no cartridge slot for NES games. This is an issue for me, personally. There is a slot for Famicom games, and you can purchase an adapter to convert 72 pin NES games to 60 pin Famicom games. At this point, there seems to be a lot of nickel and diming going on with this system, which is already more expensive than the competitors. So, this system can play more systems than the Retron 5, can play downloaded roms, but you have to by add-ons which raises the cost a lot more. This is not as accessible as the Retron 5, as this has to be imported from Japan, so its definitely not for the casual gamer. The whole system is the size of a deck of cards. A third option, and one that has been increasingly popular, is to run Retropie on a Raspberry Pi mini-computer. A Raspberry Pi is a budget computer on a PCB the size of a credit card. There have been several revisions, but as of the time of this writing the current version features hdmi out, 4 usb ports, blue tooth connectivity, and a micro-sd slot. This can be easily bought online, for about $35. After adding controllers, power cord, sd card, protective case, and hdmi cord, your looking at around $85. Retropie is a program that runs emulators for all of the older systems, and roms can be loaded by the user. Its small size introduces a huge convenience factor, as it is very portable. Obviously if you go this route you do not need any original hardware or cartridges. This brings about an interesting conundrum in that it can present all the convenience and value that a casual gamer is looking for, but its setup requires some investigation and know-how. There are social media groups that can help with this, and other resources online as well. It can be intimidating, especially to someone who is not so savvy with coding or programming, but once you get the basics in hand, the possibilities quickly unfold. NES games in high definition on a big screen are great! Since the Retropie is pure emluation and not dependant on physical media of cartridges or discs, the number of systems emulated is only limited by the software available. Systems like NeoGeo, which is cost prohibitive, can now be played with relative ease. MAME, or Multiple Arcade Machine Emulator, is a big draw for me, but its setup is perhaps one of the most complicated due to all the different arcade system Bios'. You can use any usb controller, but you can also step up your game and use a bluetooth controller. It will have to be configured in the system settings, but again, there are online tutorials to do this. I use an 8Bitdo SNES30 controller, which looks and feels identical to an original SNES controller; highly recommended! For all of its benefits and positives, the Retropie to me has one flaw, and it is lag. I have looked up how to mediate this, and used the correct tv settings, but for some reason, the lag on the Retropie stands out to me. I hardly notice the lag on the Retron 5; I know that many people complain about it, but to me its worse on the Retropie. This is not an issue for most games, but for game that require twitch movements, like shoot'em ups, Punch-Out, or even Pac-Man, this is a fatal flaw. Shooters are my favorite genre, so this is an issue for me. Hence, my Retropie is relegated to parties and casual gaming. So all in all, emulators and clone systems are attempts at making retro gaming more convenient with some improvements, with HDMI upscaling chief among them. Not everyone can have multiple game setups in their home with boxy crts taking up space, so clone systems are attractive in this sense. Emulators are the cheapest way for people to play games. The truth is, that everyone has their own preferences and opinions, and it is this very reason that conversations can happen and are interesting. Whichever method of gaming you prefer, remember that you are all drawn to something in common, and that is playing classic games.